In early October when I was in the midst of the first trimester and was totally exhausted and nauseous and falling asleep every day around 8:30, I decided to make a Halloween quilt. I had a stack of leftover 5.5" squares sitting next to a stack of leftover 3.5" squares on my cutting table and they looked nice and Halloween-y so I thought I'd add borders to the smaller squares and turn it into a quilt. I even had backing fabric. 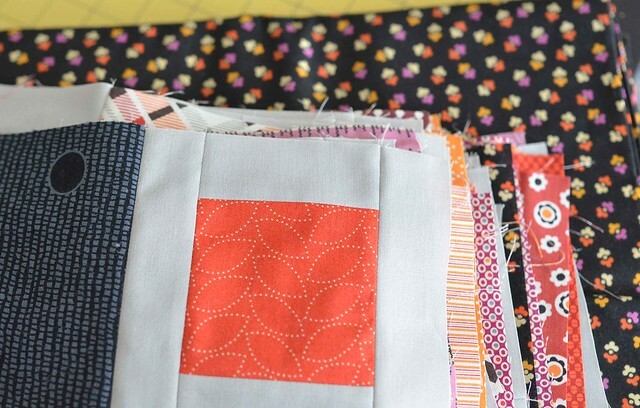 In the end I only had to cut 10 extra squares to make a nice sized lap quilt so I got started. Only I didn't really feel like making anything and I wasn't very excited about this quilt so progress was painfully so slow. So slow in fact that it eventually stopped and it has been sitting on the counter ever since. Do you know how many unfinished projects I have? Just this one. I hate leaving things unfinished but I just can't find the energy to finish it right now. Maybe it's a quilt for next year, but for now I will just have to deal with having an unfinished project. I have been working on something that I will be sharing soon. It is a custom order twin sized quilt similar to this one and even though progress on this one has also been slow, it has been fun to work on and I am excited to share it. Sometimes, I realize a quilt just isn't worth my time anymore. Better to work on something that you feel is deserving of your attention - life is to short to waste working on quilts you just aren't into! AAAAHHHH!!!! Congratulations! How did I miss that news?! I'm so excited for you. :) Hope you're feeling well. no worries!! Next year you will have fabulous inspiration for that Halloween quilt, for now, relax and enjoy your wonderful news!!! Happy Thanksgiving!! I had no idea No.3 was on its way. Congrats. When are you due?